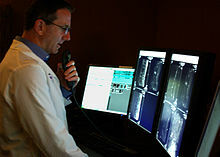 A Radiologist interprets medical eemages on a modren pictur airchivin an communication seestem (PACS) wirkstation. San Diego, CA, 2010. Radiology is a specialty that uises medical eemagin tae diagnose an treat diseases seen athin the bouk. This page wis last eeditit on 24 August 2017, at 20:27.